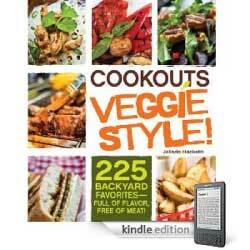 *** FREE *** Get Grilling this 4th of July with “Cookouts Veggie Style!” eBook ~ 225 Recipes! Move over hamburgers, hot dogs, ribs, and barbecue chicken! VEGGIES are the new main attraction at cookouts this summer! Beginning Thursday June 30th to Monday July 4th, enjoy the Cookouts Veggie Style! ebook by Jolinda Hackett for FREE for Amazon Kindle, Sony eReader, or from the Google and Apple iTunes eBookstores. This eBook contains 225 vegetarian (and some vegan) recipes that are fresh, fun, colorful, and most importantly delicious. Incorporate these meat free meals with other traditional cookout dishes OR create a revolutionary veggie spread for your Fourth of July extravaganza! Download this eBook for FREE and get started on recipes like Halloumi Skewers with Lemon Parsley Chimichurri (yum), Cajun-Rubbed Portobello Caps (delish), Fiery Chipotle Butter Corn on the Cob (mmm! mmm! ), and so many more! Great Father’s Day Gift Idea ~ Enjoy 12 FREE Omaha Steaks Burgers With ANY Purchase!